Oh boy, that is the question. That's a really good question and I tell you, I really believe that you should pick something that you really like. And I think this is pretty important, because I think I see a lot of people now that I'm getting more experienced in this and I've talked to some people in this industry, and what you see is that a lot of people get excited about popular keywords that they have absolutely no interest in, and they put sites up there and they might do something on it, but what you don't get is the staying power. Because people aren't interested in, over time, to continue to update the sites or they may lose interest, and I actually think what may happen in the future is that the search engines are going to get on to this and might get smart about this and we might see some lower rankings and so forth because this is such a popular thing now where people are spreading their interests everywhere and trying to put virtual real estate sites out there on any topic, doesn't matter what it is. And I think that just for your own sake, just so you have staying power and you're doing something that you're interested in, that you should really pick a topic that you're interested in. What was it that attracted you to ClickBank in particular to do some of your affiliate marketing? Just popularity, I'll put it that way. It's just the easiest one to work with. I think that a lot of people use it today and now that ClickBank is affiliated with PayPal too, I think it really has become a very easy way to sell products, and that's really the key for me. 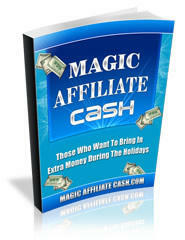 How much do you make just as a ClickBank affiliate? ClickBank affiliate for me has actually just started in the last six months, so that's kind of interesting because before that, the people I associated with actually had their own affiliate sites, their own affiliate management sites. And just recently I started doing the ClickBank stuff so it varies, it can vary basically month to month. In the last six months, I mean it started out, all of a sudden I got a rush of things and anywhere from like three to five hundred dollars a month, and that's probably been my best month so far. So anywhere from 100 to 500 a month. What ClickBank products do you promote in particular? Right now, the two I am promoting is Holly Mann's site, How 2 Make Money Online. I think she originally had called it Thank you Rich Jerk. I'm not sure if that URL is still hers, but that one, and I'm also promoting Bloaaing to the Bank. The blogging product that has a lot of buzz right now.